This is the best homemade Italian meatball recipe. 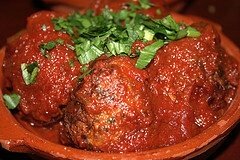 Big, juicy meatballs that are so flavorful. Offering many authentic Italian recipes to choose from to call your own. Place the meat in a large bowl and add the torn bread. Add the remaining ingredients and lightly mix well - with your hands (over-worked meat produces tough meatballs). Oil your hands and form the meat mixture into 12 balls. Place on a cookie sheet and bake for 25 to 30 minutes, or until meatballs are browned and cooked through. This recipe makes approximately 10 to 12 large balls, 30 medium balls and 50 small balls. Bake the medium balls for 18 minutes and the small balls for 12 minutes. About 5 minutes before serving, add the meatballs to the pasta sauce and warm through. This easy Italian recipe is a winner at our house. Moist and so delicious. Combine all ingredients by hand and mix well. Wet hands and form into 2 inch balls. Fry in oil until evenly browned before lowering into simmering spaghetti sauce. Stir occasionally with a spoon and simmer for a few hours.